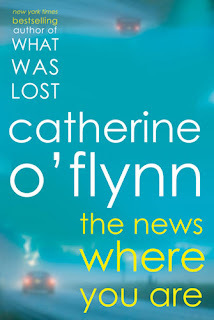 What Was Lost, Catherine O'Flynn's first novel, was longlisted for the Booker Prize in 2007 - but sadly didn't make the shortlist, despite being one of the best novels I read that year. Her followup, The News Where You Are, was published a couple of months ago, and I finally got my hands on a copy last week (note: the fault was all mine). I'm disappointed that it didn't make this year's Booker longlist, because that would have exposed it to a greater audience, but I'm sure it will still find a happy readership. Frank Allcroft is a middle-aged local news presenter in Birmingham. Unlike some of his colleagues, who see regional news as a trivial relic, Frank genuinely likes the local focus and has developed minor local fame as the teller of incredibly corny, poorly-delivered, jokes in the news broadcast. His predecessor & friend Phil, who left Birmingham for brighter things with a national audience, has died in a hit & run incident. His late father, a once-renowned architect, is suffering the final indignity, with most of his buildings being torn down & replaced by more modern designs. His mother, determindedly unhappy, lives in an aged-care home. And Frank finds himself increasingly worried about the forgotten people - those whose deaths are barely noticed, and whose lives are swiftly erased. The News Where You Are is a novel about people's legacies - how they are remembered, how their lives (& deaths) affect those around them, and how we the living continue living without them. Frank finds himself investigating the life & death of Phil's friend Michael, who has also recently died (Phil and Michael were both a generation older than Frank), and tries to track down people who may have known this friend of a friend, hoping to find someone who might remember Michael. He also spends time with Cyril, an unsuccessful comedy writer whose only consistent gig appears to be scripting Frank's wince-inducing puns for the news, and Michelle, Phil's (young) widow. As his father's buildings are being scheduled for demolition, he tries to save at least some of them. And he, along with his wife Andrea & daughter Mo, try to brighten the life of his mother. Through these intertwinning elements, we also occasionally flashback to Frank's childhood, with his self-important father trying to design a better world through architecture, and also to the last few months of Phil's life. O'Flynn weaves these tiny moments together effectively. While The News Where You Are might sound overwhelmingly melancholy, those themes are handled with a lightness of touch that finds small moments of humour and a warmth towards its characters that keeps the book from sinking into depressing bleakness. Much of this has to do with Mo, who is refreshingly real for a child in a modern novel (she's not brilliantly intelligent or talented, and actually acts in ways that seem familar). Mo's genuine desire to make her grandmother happy, and her interest in some (but not all) of what her father tries to show her are well-drawn characteristics. Frank himself is aware that his increasing interest in the past, and in people who have died, is not entirely healthy, but also recognises that he needs to remember people and deal with his father's & friend's legacies. 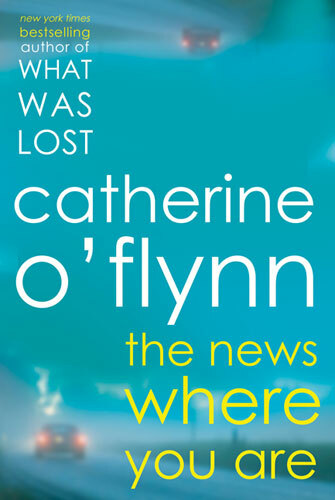 In many ways The News Where You Are is a small novel - it's short (250pp) and easily read, and O'Flynn doesn't really go in for huge, shocking plot twists (there is one revelation, but it's underplayed, not so as you'd miss it, but it certainly doesn't feel like a cheap thrill). Yet at the same time, as I've noted, it considers some fairly weighty themes like how we remember and are remembered, and friendship, and relationships with our parents and children. Highly recommended, and I look forward to Catherine O'Flynn's third book. I have a copy of this one I hope to read soon. I haven't read What Was Lost yet, but I remember hearing many people rave about it at the time. The theme of legacies sounds wonderful to me too. I'll have to get to this one soon! Well, I hope you enjoy both of them as much as I did!